Chiawana High School, located in West Pasco Washington is the second of two high schools in the Pasco School District. Home of the Riverhawks, Chiawana opened its doors in the fall of 2009 to the school’s first freshman, sophomore, and junior classes; the first senior class graduated in2011. The addition of Chiawana to the Pasco School District is attributed to the rapid development of West Pasco. The mission of Chiawana High School is, To ignite world-class learning, resulting in thoughtful and accomplished individuals. Chiawana's mission will be achieved through the school’s commitment to building positive relationships between its staff and students, making time for staff to collaborate for the purpose of improving student learning, and through the use of various types of research to make guided decisions about effective teaching and learning strategies. 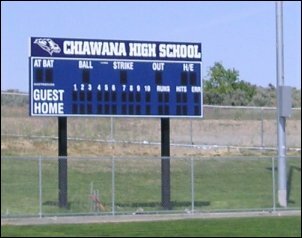 Chiawana features its own athletic facility including a lighted football and soccer field, as well as an indoor gymnasium. The Riverhawk athletics department offers a wide variety of sports for its students to participate in throughout the year including, but not limited to soccer, basketball, cheerleading, golf, baseball, softball, cross country, wrestling, tennis, football, dance, and bowling. The Chiawana football team won the 4a Washington State football championship in 2013.